In partnership with the internationally renowned Sidney De Haan Research Centre for Arts and Health, we launched the report Cultural Value and Social Capital at the House of Commons on 16 July 2014. 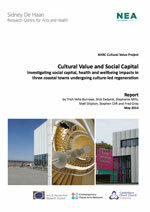 The report formed part of the Arts and Humanities Research Council’s Cultural Value Project and involved research into the work of three cultural organisations in coastal towns – Turner Contemporary in Margate, the Creative Foundation / Folkestone Triennial and the De La Warr Pavilion in Bexhill on Sea. We studied the impact of their work on their local communities and found interesting preliminary results in terms of the health, wellbeing and social connectedness of their audiences and users. At the launch a distinguished panel of speakers welcomed the report’s findings and recommendations, and debated some of the topical issues it raises. You’re welcome to view a 7 min film of the event and to download the report.